Snippets.me Blog: Snippets 0.7 and Distributors — the new power of Snippets. Snippets 0.7 and Distributors — the new power of Snippets. In the initial post (actually first post in this blog) where we introduced new Snippets I told about 4 core values of Snippets. We started by creating desktop apps for Mac and Windows which support sync from the box, and continued with integration. Recently we discussed the fundamental problem of standalone code snippets apps which has not been solved by anyone yet. Well, until now. The reason we raised this question is because we have a solution and today we are very excited to announce our new invention which we call Snippets Distributors. Distributors are plugins for Snippets that allow you to reuse code snippets from your library in code editor natively. At first glance, it may be hard to understand what it is and how it works, but in reality it is very simple, and once you try it, you will love it. Distributors are available in Snippets 0.7 on both Mac and Windows. By updating or downloading the latest version of Snippets you will get them all. We've also created a directory of Distributors where you can find all available distributors as well as specific notes to each of them. Using distributors is very easy. Just download or update currently installed version, open Distributors window by pressing Cmd+Shift+D on Mac or Ctrl+Shift+D on Windows, select distributor on the left side, select “Enable” checkbox and you are done. By default all snippets which has code and tab trigger defined will be available in the editor. Please note that some editors should be restarted in order to make new code snippets available. 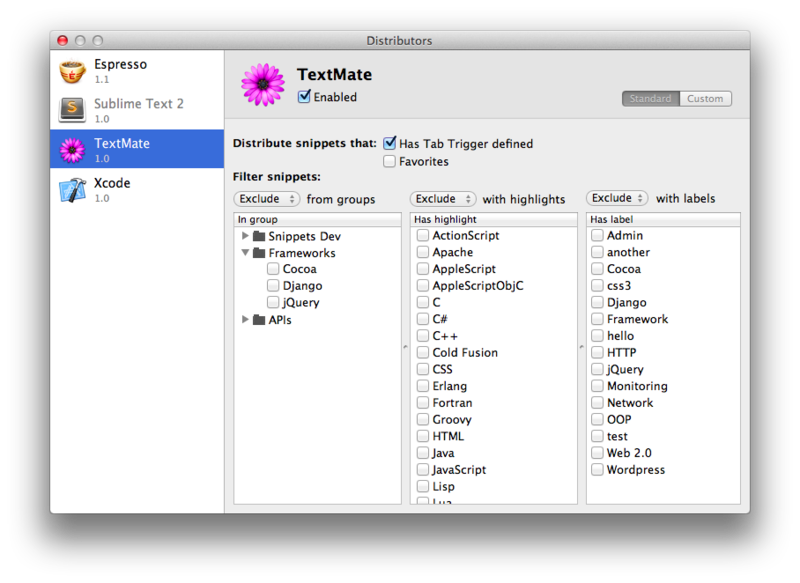 We recommend to try it with TextMate 2 (Mac only) or Sublime Text 2 (Mac and Windows), these editors will pick up everything automatically without restarting them. This update also includes some new goodies such as Snippets Assistant and Global Search on Mac (on Windows it’s been available since version 0.5). Also both clients now use SSL encryption when syncing data with the server. Looks awesome. A distributor for Eclipse (Windows) would be great! Thanks a lot. It is really awesome and we are very excited about this release. As far as I know from my early research on Eclipse and Distributor for it, Eclipse doesn't support code snippets from the box. It has a bunch of plugins for this. Since I do not use Eclipse I don't know most popular plugins. Could you please share what plugin you use and what are the most popular. We want to support most of them. Code Recommenders snipmatch plugin can be used. it supports git repository. just tried to use the distributor for Sublime Text 2. But got error message: "Seems like Sublime Text is not installed. Can't locate Snippets folder." I'm using ST2 on Win7 as portable version. Any hints? Portable version of Sublime Text as well as Sublime Text 3 is not supported. Sorry. This is such a nice feature, thanks for this. "Seems like Sublime Text is not installed. Can't locate Snippets folder"